It is the sign Gemini. Lives between Varna and Sofia, but says of himself that he is an inhabitant of the world. He has "Drama Theater and Cinema" in the class of Prof. Seykova. He loves the sea. Likes to travel. His hobby is music, and subsequently became his profession. He has worked as a musician in Norway, Sweden, Finland, Germany, Spain and the Canary Islands. He was a soloist of the Ensemble of the Navy of the Republic of Bulgaria. In 1999. with his colleague Peter Pesev create duet "The Fifth Element". Over the next year and released their album "The Fifth Element". Most of the lyrics and music are the work of Teddy Genev. The songs include a duet in six compilations. In 2002. duet stop there. 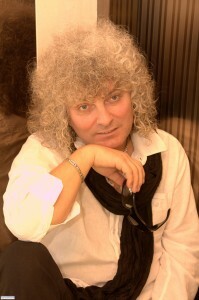 First solo song of Teddy's "Blue Room" in his music, lyrics and arrangement Valentine Marzakov of Krasimir Iliev. With this song Teddy Genev won third prize in the Spring BNR Radio Contest in 2002. In the same year he took part in the festival "Burgas and the Sea" with the song "Autumn strings" with music by Peter Pesev. Following duet songs recorded by the star of Bulgarian pop music Hranova Margarita. These are the songs "Love Dance," "South recollection," "A Christmas Carol", "Beautiful Bulgaria" and "Seasons and Sparks," starring the great Bulgarian aktrira Iskra Radeva - all his music and lyrics. In 2004. Teddy Genev went on a tour of the Canary Islands. In 2010. He released his first solo album "My Flower". Motto: "Everything can be achieved if planned correctly and if there is a desire and creativity." Favorite phrase: "Everything is under control."